When Hollywood comes calling: First Man, Universal Studios, Ryan Gosling and the cobalt bomb. In August of 2017, I was contacted via email by a researcher from the United States, Hilary Ament. She was on contract with the producers and production crew of the movie First Man, a biopic of Neil Armstrong, the first man on the moon. Based on a biography written by James R. Hansen, the movie focuses less on the moon landing and more on Armstrong’s life and relationships and family. Armstrong is portrayed by Hollywood megastar Ryan Gosling, and his wife Janet by the cool beautiful Claire Foy. One of the storylines, a moment which created a particular sad trajectory in the Armstrong family, was learning that their young daughter Karen had brain cancer. Ever the scientist, Armstrong worked feverishly to find a cure. The movie was set to include a scene where Karen would undergo treatment using the cobalt-60 machine, known as the cobalt ‘bomb.’ Originally developed and designed in Canada, the cobalt machine was the first deep-seated cancer radiation technology designed specifically for clinical application. Hilary found me via the University of Saskatchewan and the Western Development Museum, where the original Saskatchewan-built cobalt-60 machine is on display. Searching desperately for technical insight, she came to me. I had been working intermittently on a biography of Saskatchewan physicist Sylvia Fedoruk (of ball, curling, and Lieutenant Governor fame) who had been a graduate student working on the original cobalt bomb project. Syl’s files, along with those of Harold Johns at the University of Saskatchewan Archives and Special Collections, were a treasure trove of information. I sent a short description, taken from my in-progress manuscript on Sylvia Fedoruk, about cobalt-60 and how radiation works to fight cancer. I also sent along a description of the treatment room constructed at the University of Saskatchewan which housed the original cobalt-60 unit, along with schematics. The original room featured a ten inch thick glass window, where technicians would monitor the patient during radiation. As well, I passed along descriptions of the way treatment technicians would design special padding or apparatus to hold a patient in place. For a young child like Karen, holding still was paramount, and the technicians would have worked with both Karen and her parents to make the little girl comfortable and at ease. Of course, Karen would have been given multiple radiation doses, not just one, but a major Hollywood movie has time constraints. All of this work would go into just one scene. I was thrilled to help, even in this small way for a tiny scene. So of course when First Man hit our little Majestic Theatre in Biggar in the fall of 2018, I was in the audience, bright eyed and ready to see what it all looked like. There’s nothing like watching a movie in a small, community-owned theatre in rural Saskatchewan. The Majestic is our local site for all things arts. Built in 1909 and rescued from oblivion, it hosts music festivals, live concerts, plays, dance festivals, and musicals, as well as movies on Friday and Saturday night, along with the popular Sunday afternoon matinee. Run by volunteers, it’s one of the focal points and gathering spaces for our community. In the audience, scattered alongside and all around me, munching popcorn and slurping drinks, were friends, neighbors, and relatives. In the city, a movie experience is rather impersonal. Sure, the audience laughs together in all the right places, but we don’t necessarily know our neighbors or the ones who sold us the ticket or handed us the popcorn or took a quick bathroom break in the stall beside me before the opening credits. In a small community theatre, the vibe is completely different. We don’t need a lot of previews or games on the screen. We’re busy chatting: do you have enough stuff for the raffle table at the hockey game? Are you hauling wheat this week? Can you curl for me next Wednesday night? Once a movie starts, you recognize the different audience laughs — brother in law Ryan, good friend Tina. We count how many people are there and celebrate a movie that’s going to make a profit. And lots of us have learned to clean up behind ourselves, taking garbage out on our way back through the lobby. The night I went to see First Man, there were plenty of friends and relatives in the audience, many of whom knew about my encounter with Hollywood, and had almost as much anticipation shivering through them as I did. We could experience it together. The cobalt-60 scene comes early in the movie, and I sat forward to watch every detail as it shimmered on screen. With Karen’s neck supported, her head exposed and her body gently strapped in place, she looked just as I had imagined. The Eldorado-style machine looked like a miniature version of the space-age rockets Armstrong was working on. The treatment room had no windows, with thick concrete walls lined with lead. Neil and his wife Janet watch from behind the thick glass window helplessly, overcome with hope that the treatment would succeed. It was an amazing moment as a researcher. I had helped to shape the way a movie looked, the way the actors moved, the set design, and the whole feel of the scene. I was jubilant. But Hollywood has a way of surprising you. My work, offered to Hilary Ament and to Universal Studios, had not just shaped the visuals. It had actually changed the script in the movie. My mouth dropped in shock at the next scene. In it, Neil Armstrong is on the telephone to the doctors at the hospital. He asks [and this is my memory, not a direct quote], Did you call Dr. Johns? Dr. Harold Johns? The doctor in Saskatchewan who invented the treatment? I couldn’t help it. Even though this is a scene of great pathos and sadness, learning that the much-hoped-for treatment didn’t work on his daughter, I was lifted right out of my seat, cheering. My poor husband was hushing and pulling me down, but others were just as jubilant: hey, they said Saskatchewan! Tears leaked out, both for the memory of a little girl full of sunshine whose life was cut short by cancer, and by my own personal victory: I had had an influence on a Hollywood movie script. A whole scene, then another, shaped by my research and insight. And Saskatchewan got a mention. First Man is up for four Oscars at the 2019 Academy Awards, one of which is production design. I’ll be watching with delight, hoping for a win. After all, I do have a little bit of skin in this game. I wish I could say that I found my name in the credits. Several of my friends and neighbors, and my brother and sister-in-law, went close to the screen (none of us are youthful) to try and find my name. Nothing. Nonetheless, I have the paper trail and the emails, and the movie scenes themselves to back up my story. Hollywood, if you’re listening, come again. Saskatchewan has a few more hidden stories for you. But next time, I’d like to be in the credits, please. And yes, I’ll be watching it at The Majestic. This is a story about aborted academic work. Years ago, I proposed and workshopped a paper. The original call came from fellow environmental history academics, building a curated book on the concept Landscape, Nature and Memory: Tourism History in Canada. We wrote the papers and sent them around for everyone to read before we got together. The workshop was held in Vancouver, and I remember my first introduction to Granville Island and Macleod’s Books. It was an invigorating workshop, with discussants and good conversation. I received good feedback (Ian MacKay liked my paper!) and thought that it would, in time, lead to publication. At the time, I was still occasionally aiming hopefully for an academic position. But it was not to be. When the collection of papers from the workshop went around for external review, mine was deemed not a good fit for the overarching theme. It was too different. In some ways, I think the paper’s exclusion mimicked my own ‘differentness’ and ultimate exclusion from academia. But no matter. I worked on it a little more, and sent it out to Prairie Forum, a scholarly journal based out of Regina. I’d published with them before, and thought the little paper would have a chance to at least be read. I didn’t hear back. At all. Strange, I thought. I forgot about it for a bit, then (remembering), dusted it off, and sent it to them again. It’s the internet, I decided. It does eat things, on occasion. It gets hungry. No worries. I’ll hear back this time. Still nothing. No reply, no acknowledgement. So, I may be slow but eventually I get there. This poor little paper doesn’t have a home. I could go back to it, work on it again, try to figure out where and how to make it academically publishable. Send it out again. And again. But that is no longer my life. Writing for an unpaid academic publication just isn’t an appropriate use of my time. So I won’t. But it remains there, with many hours of research, and a lot of thought, hiding in a corner of my computer files. There is an old adage that says ‘unread books do no work.’ The same is true for articles. I didn’t manage to get it published (which would have meant external reviews, more work, and no doubt a much better article) but I can share it here, with you. The article is about building the South Saskatchewan River Project, now known as the Gardiner Dam which created Diefenbaker Lake. It’s about the policy stories we tell, and how Saskatchewan desperately needed to create a story of water and beauty through tourism to counteract the post-Great Depression story of dust, aridity, and flatness. Who might want to read it? Anyone who has visited the dam and wants to know a bit more of its history. Academics working on tourism, dam, or general prairie history might find it useful. But if you are not an academic, I warn you: this is filled with references, theory, and a bit of jargon. And a few stories. It might be worth your time. Still, I’m ready for it to be in the world, with all of its flaws and problems. You can deal with it. I have confidence in you. Click on the PDF below and enjoy your read. The following was originally published (in slightly edited form) for ActiveHistory.ca 23 January 201. We’re a group of historians interested in thinking about history and its current and future applications. So, I’m writing a book. What follows, for your January darn-it’s-cold-and-I’m-ready-for-something-kind-of-fun reading pleasure, is a primer (briefing notes) about the book. Given the growing recognition that Mother Nature remains strong and rather angry about human-induced climate change – kudos to everyone who spent Christmas with no power – I’m writing about human migration. Drawing lessons from families who pulled up stakes and moved during the Great Trek from one biome (prairie south) to another (boreal north) due to drastic climate and economic problems during the Great Depression and Dirty Thirties, this book is based on history but with an eye to practical suggestions for the future. Imagine me having a conversation with my Grandpa and Grandma: what should I do to be prepared? Some of the following five lessons may or may not apply to your situation. It depends if you have a horse. Lessons may be tongue-in-cheek or serious. I’ll leave it to you to figure out which is which. The underlying premise of the book is that climate change is happening and is worsening, and that Canada (in particular, Canada’s middle north and north) has been pinpointed as a place to which climate migrants from around the world may flee. Leave sooner rather than later. Leave at the first sign of things going drastically wrong. Use this opportunity to go directly to a place where you think you might like to be. North Bay, Ontario? The Pas, Manitoba? Prince George, BC? Excellent choices – fresh water, some farmland, some trees, but with access to hospitals and schools. Edge places, with a lot of variety. You will be much more successful if you move sooner and get established, while you still have some capital and some energy. Waiting, hanging on where you are until the last moment, will cause you trouble in the long run. Takeaway: pull out your map of Canada and pinpoint possibilities. Then do your homework. Take family with you. And friends. And choose a place where you know a few people already. This is called social capital and you will need it. If things go to ‘hell in a handbasket’, as the old saying goes, you may need to rely on each other, pool resources, work together. This is no time to stand on your own, be stand-offish or independent. Social capital can save you or pull you through when things are tough. This will also help when you get lonesome and homesick for the place that you had to leave. Having your family and friends with you, instead of leaving them behind, will take the edge off your move. Takeaway: start making a plan, involve your friends and family, and make your social capital work for you. You will probably have to take lots of small jobs that rotate seasonally rather than one job. Yes, you’re right, you will be poorer. But you shouldn’t starve. Losing the single employment that brings in cash can put you in the poorhouse faster than you can say ‘mortgage payment.’ Having lots of small jobs usually means that you have a lot of skills that are portable and have value. You will need to be flexible if you are forced to move because of climate change. You may not find a job in your area of expertise, or you may find one but it may not be full-time. As the economy shifts beneath our feet, you may need to branch out. If you’re already on this path, good for you: you’re one step ahead. Takeaway: the future economy is perilous. The one-job, one-wage norm is changing. Change first, on your own terms. Be ahead of the curve. Physical labour will probably be required. Some of it will be hard, some of it will be icky. Learn to chop wood, use a chainsaw, haul water, build a fire, cook with wood, grow a garden, pick berries, shoot a gun, catch and gut a fish, learn your plants in the real world instead of the supermarket, and in general get closer to the land. Buy workgloves and work boots and work clothes. Expect your work days to last longer than 7.5 hours. Expect to work outside in all weather, in all seasons. Can you fix things yourself? Brush up on that. If storms and floods and fires and other major catastrophes are increasing, you need to be ready. Takeaway: join Scouts, make friends with an active grandparent who cooks, sews, cans, and has a garden, volunteer at a summer camp, take classes in plumbing, electricity, carpentry, and mechanics, and get fit. Be brave. Your horse might die of swamp fever. Otherwise known as ‘migration surprise,’ there may be material things (wifi gadgets, electrical gadgets, cars) or animals in your life who will either miss the old landscape so much that they won’t work in the new one (if, by chance, you end up in an off-the-grid cabin in the woods) or they find something in the new one that may kill them. Horses, for example, seem very good at contracting infectious anemia (swamp fever). Transmitted by mosquito bite, and mosquitos are common to nice wet areas, the best line of defense is to learn to make a smudge. Build a fire, then partially smother it with wet straw. Smokes like the dickens. Mosquitos hate it. Word of warning: cars don’t like northern roads, which are notorious when they exist and worse when they don’t. Buy a truck. With a winch. If you can’t afford a truck, and only have a car and a horse, take your chances on the horse. As for your internet fix, that’s harder. See lesson one about choosing your destination. Takeaway: cars vs. horses: horse wins. Cars vs. trucks: take the truck. And address your wifi habit before you go. Recap: move first, move with friends and family, be flexible, be prepared, and be ready for surprises. This article was originally written for The Otter, the blog of the Network in Canadian History & Environment (NiCHE) and of which I am a member. It was posted Jan 20, 2014. In January, I attended the annual Crop Production Show in Saskatoon. If you love climbing on tractors and combines, swathers and sprayers, and seeing the new (and increasingly large) agricultural technology, this is the event for you. The organizers also have excellent break-out sessions that cover everything from new crop ideas (camelina, anyone? Anyone? How about quinoa?) to market trends to future ag innovation. As an active farmer in west-central Saskatchewan, #CPS14 is a must-see. But a couple of points caught my attention – and gave me that feeling of contentment, like a cat being stroked while laying in a warm patch of sun. I was content because I saw the future. First, the backstory: in October 2013, I participated in a University of Saskatchewan Learning Communities public forum called The Future of Farming. (I wish I could post a link to the forum, which was recorded, but it’s still not on the website. I’ll keep you informed). Along with my co-presenter, Terry Tollefson from the Department of Soil Science, we had a lot of fun, casting our minds forward to consider: what will farming look like in western Canada in the future? As a historian, trained to research and create stories built on the past, thinking about the future is a fantastic exercise. Even if you’re not inclined to science fiction, dystopic, or otherwise futuristic imaginings, I do recommend it. It’s a bit like math plotting on a graph: if this, and this, and this are the trends, where might the next point on the graph be? I decided to focus my talk on three points. One, the future of farming is an increase in the farm-to-fork movement. That means a closer connection between consumers and producers, whether that is through farmers’ markets, on-farm visits, organics, or food baskets delivered directly to consumers. Locally-sourced and fresh are buzzwords with impact. I have personal concerns with this movement (which I support in both principle and practise) but those can be held for another day. The second point I made during that public forum is, our farm future of western Canada is increasingly twinned with the future of bearded, plain-clad men (and kerchief-covered, dress-wearing women) sporting rather German accents. If you don’t live in western Canada, the answer is: Hutterites. Hutterite colonies (Hutterian brethren) offer socially integrated, religious-based, well-funded and well-resourced entities that are at the forefront of farming. They have an immense manpower base – kids often leave school at 14 to enter adult, full-time productive farm life, with specific roles and training. Hutterite farms are massive mixed farms that straddle both commercial productive agriculture (from grains to pork to dairy) and subsistence-based, farm-raised produce for sale at farmers’ markets or direct to consumers. I get my chickens and eggs from one of five local Hutterite colonies near Biggar, and buy plenty of produce in the summer. Hutterite men were everywhere at the Crop Production Show. And the agricultural retailers, wholesalers, buyers, and manufacturers gave them full attention. With their increasing land base, connections to both commercial and local-style agriculture, and solid financial backing, the Hutterite farms are major players in our agricultural future and a model and lesson in how to balance the competing demands of commercial agriculture to feed a growing world population (hear Bill Gates get excited about fertilizer and feeding the world) with the need to provide consumers with confidence in our clean, healthy food (see the A & W campaign for better beef). My third point was, the future of farming has a specific direction: north. I’ve been researching the future of western Canada through the prognoses of climate scientists. Climate change predictions, in a wild case of positive spin, are pointing to Canada as a potentialsuperpower, a net winner andenvy of the world in global warming. As the Globe and Mail publishes in January 2014, the ‘magnetic’ north is Canada’s ‘last frontier’. These predictions offer a sense of historical whiplash, particularly for me. Unlocking frozen northern soil opens up a scenario of northern migration, of farmers, crops, animals, and whole societies moving north – a repeat of the Great Trek migrations I document in the last chapter of Forest Prairie Edge: Place History in Saskatchewan (April 2014). 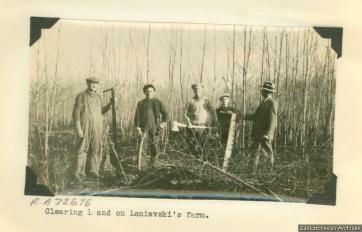 During extensive droughts in western Canada between 1914 and 1938, the prairies dessicated, cracked and bled people in torrents. Thousands of those migrants – an estimated 45,000 in Saskatchewan alone between 1930 and 1938 – moved north. They hacked and grubbed farms out of the bush in the Peace River country of Alberta, across the forest fringe of Saskatchewan, and in the interlake region of Manitoba as the last generation of ‘pioneers’ moving into Grey Owl’s famous ‘last frontier.’ They fled a capitalistic, wheat-mining landscape that could not grow gardens, feed for livestock, or crops. Environmental refugees, they abandoned the desert and turned to subsistence, following the north star toward green, wet, trees, fuel, berries, fish, game, hay, warmth: hope. Back to the present. While an agricultural show is not a noted bastion for climate change advocates, I saw plenty of evidence of climate considerations, from cold-weather and wet-adapted crops to insurance changes to an increase in back-to-the-land, alternative fuel, organic and clean food, and new transportation businesses. With the real threat of wild weather and electrical mayhem upon us, as Dagomar Degroot noted, climate change is bearing down. It was fun, as a historian and active farmer, to let my thoughts fly forward instead of backward, projecting toward the future of western Canadian agriculture. What I see is a similar whiplash, a growing movement to reconnect to landscape, rebuild the ties that bind each of us to the earth. My advice? Make those connections in a place that has the basics of life: water, trees for shelter and fuel, and earth to grow a garden. Or at least, connect to a farmer who is already making that move.